LONDON, July 23 (Reuters) – A ban on 113 oil tankers by Nigerian state oil company NNPC must be lifted immediately as no grounds have been given for the measure, the global oil tanker industry association said in a letter of protest. NNPC issued a letter on July 15, citing a directive from President Muhammadu Buhari, which said the vessels, mainly VLCC crude oil tankers, were banned from calling at Nigerian crude oil terminals and also from Nigerian waters with immediate effect. Industry association INTERTANKO, whose independent members own the majority of the world’s tanker fleet, said in a letter to NNPC, dated July 22, that there were no “evidence or grounds” given for the ban. “INTERTANKO protests in the strongest possible way that these bans should be lifted with immediate effect until grounds and evidence for the ban have been given to each vessel and vessel owner/operator, and the owner/operator has had an opportunity to respond,” General Counsel Michele White wrote in the letter. Since taking office in May, Buhari has been working to fulfill a campaign promise to tackle corruption, particularly in the oil industry. He has dissolved the NNPC board and ordered an investigation into a scheme through which the country swaps crude for oil products such as gasoline. “The timing of the ban is clearly a political signal to show the Buhari administration is clamping down on oil theft,” said Alex Vines, head of the Africa Programme at Chatham House. A sample of 75 vessels on the list that Reuters tracked showed only around 14 had been to Nigeria or neighbouring countries in the last 180 days. INTERTANKO’S White said the list of banned tankers was “not exhaustive and already further tankers are being added”. “Our current understanding is that these ships may have been targeted due to a failure to provide official outturn figures at their last call and/or commercial differences between load and discharge figures for cargo and free water,” White said in a separate note to members. 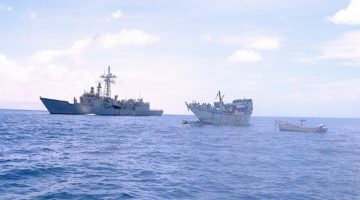 White said after INTERTANKO had spoken with its members in some cases the ship had not called in Nigeria for several years, or at all. “In others, the ship has changed ownership since her last call in Nigeria,” White said. INTERTANKO said it had advised members to avoid such a provision. “Owners whose vessels are blacklisted will have to be careful that they do not commit to trading to Nigeria whilst the threat of detention hangs over them,” said Stephen Askins with shipping law firm Tatham Macinnes.